We learned to cook (and eat) several variations of Pad Thai while we were in Thailand. However, the more traditional version was our favorite. 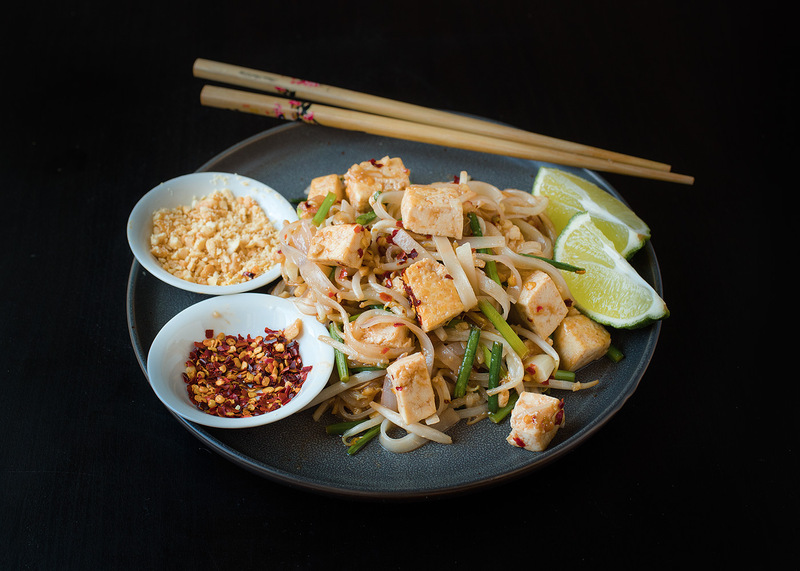 This Vegan Pad Thai (Easy Version) is very close to a traditional Pad Thai, however, it is made with ingredients that are easier to find in a typical U.S. grocery store. 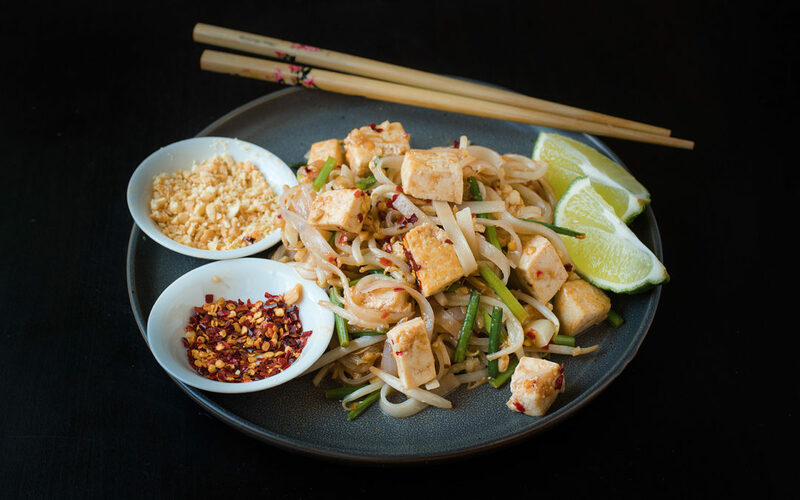 We have a traditional Pad Thai recipe coming out next week that is based on ingredients you will probably need to find at an Asian grocery store, so stay tuned for that. Note: We use a wok when we make Pad Thai, but we’ve read that people who don’t have a wok have used frying pan with success. Fill a large square dish with hot water, and place the rice noodles in the hot water to soak for 15-60 minutes. The amount of time they soak will depend on your noodles and how hot the water is. The rice noodles will be ready when they are no longer translucent and have a more solid white color to them. Then, drain them in a colander. You can do this further ahead of time as well. The cooking process for Pad Thai goes pretty quickly, so it helps to have your ingredients and sauce close prepped and separated to easily add to the wok. While the noodles are soaking, combine the sauce ingredients (tamarind, sugar, salt and water) in a small bowl and mix well. Set aside. Next, thinly slice the garlic and shallots and set aside. Chop the green onions into 1-inch pieces and set aside with the mung bean sprouts. Slice your tofu into 1-inch cubes and set aside. Crush or chop your peanuts and set aside with the red chili flakes. Heat your wok to medium-high. Once it is hot, add 2 tbsp of oil to the wok. Once the oil is hot (about 15-30 seconds), add in your garlic and shallots. Cook those until they are fragrant, about 30 seconds. Add in your cubed tofu and cook until it is browned, about 4-5 minutes. Once the tofu is browned, add in your rice noodles. Toss that with the garlic, shallots and tofu for a few seconds, and then add your sauce. Coat the noodles well with the sauce, using tongs if needed. After 1-2 minutes, the sauce should get sticky and liquid should start disappearing from the bottom of the wok. 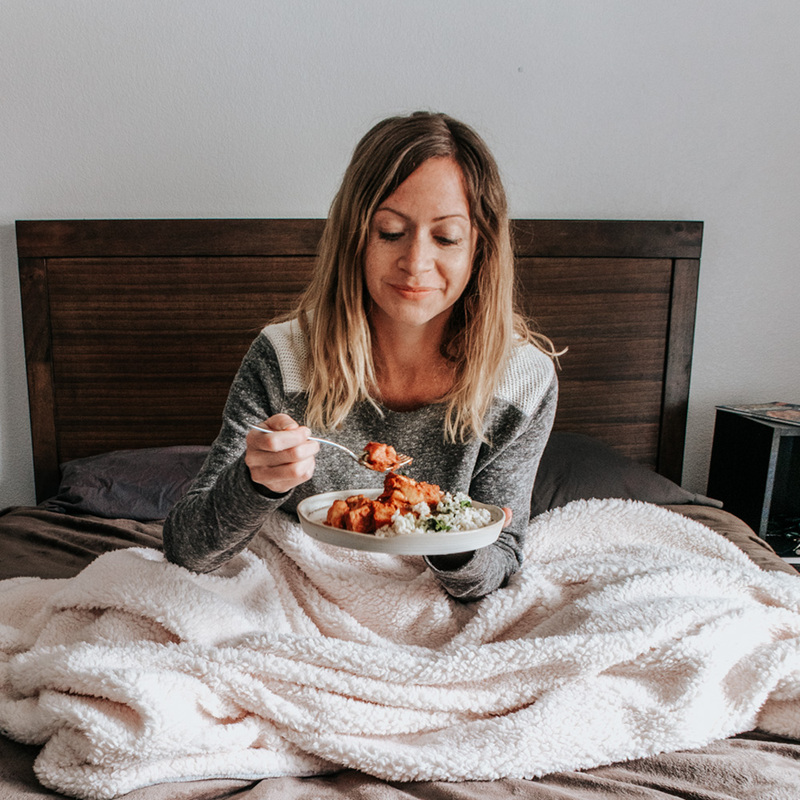 As the liquid is disappearing, add in about 1 tablespoon of the peanuts and a few teaspoons of chili flakes, depending on how hot you like it. You can always add more chili flakes at the end. Toss this with the noodles for about 10 seconds. Add in half of the green onions and mung bean sprouts. Fold them into the noodles and toss the noodles in the wok to slightly steam and cook them for about 30 seconds. Turn off the heat and remove the wok from the burner. Your Pad Thai is ready! 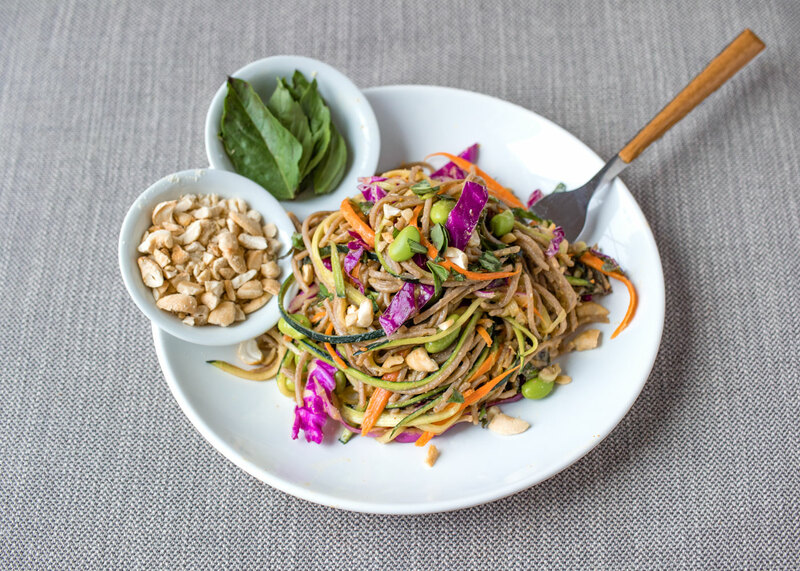 Put the Pad Thai onto plates, and serve with extra green onions, sprouts, peanuts and chili flakes. Quarter the lime and add a slice to each plate for an option to squeeze onto the Pad Thai. Enjoy!